Favorite activity: Sitting in his aerial chute so he can Monitor the IPPL office staff; they affectionately refer to him as their Quality Control Supervisor! Palu-Palu is one of our wild caught gibbons and was originally a pet purchased by Sam Pryor, the former vice-president of Pan American airlines, who had kept a number of gibbons. Pryor had actually asked IPPL to take all of his gibbons in the event of his death, but didn’t put his wishes down in writing. So, when Pryor died, his gibbons were split up and sent to several zoos. Palu-Palu was sent to the Maui zoo, where he was paired up with Jade and they later had a son, Maui. 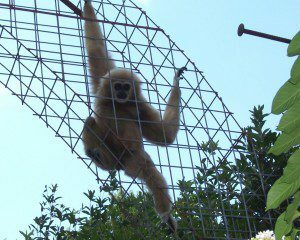 In March 1996 all three gibbons were sent to IPPL when the Maui zoo was shut down because of violations of the Animal Welfare Act and the poor conditions in which the animals were living. Palu-Palu adjusted to life at IPPL quickly and appointed himself as “supervisor” of our office staff. His aerial runway runs alongside the windows of IPPL’s office and, if people are moving too slowly, he will shake the bars and “hoo” vigorously! Even though his name is Hawaiian for “softly-softly” Palu-Palu has a very loud voice and will constantly sing along with the rest of the gibbons on the property. Always a gentleman, he will let Jade pick which foods she wants first at meal time, and will even let the squirrels that run around the property help themselves, though that has more to do with the fact that he is absolutely petrified of them!